The once “sleepy little surfing village” is now the #1 destination in Costa Rica. Jaco is experiencing a rejuvenation with restarted construction projects, a planned full service hospital and beach board walk in the near future. The new six lane super highway has reduced travel time from San Jose International airport to under one hour, so you can arrive refreshed and ready top enjoy the town. 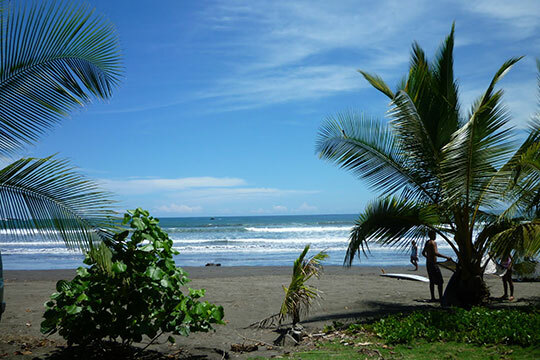 Jaco Beach (Playa Jaco), on Costa Rica’s Pacific West Coast, is the most popular destination in all of Costa Rica. Jaco is less than 2 hours away from the San Jose International Airport. Newly paved roads and breathtaking scenery on the drive down make the trip to the airport a destination in itself. Take advantage of the city’s reputation as the Fishing Capital of Costa Rica and head out just 10 minutes to Herradura Beach to the world famous Los Suenos Resort & Marina where the boating options are unlimited and you have access to Costa Rica’s best Big Game Sport fishing, along with top captains, crews and boats. Water tours range from luxurious Catamaran Island Cruises to daring Crocodile River tours. The surfing in Jaco is something that should be experienced if you have a healthy sense of adventure. While the more experienced and advanced surfers will head to the beach 5 miles down the road (Hermosa) for huge, world-class breaks, Jaco is a perfect place for your first attempt to hang-ten. Surfing lessons are offered at any number of surf shops in town or there are also tents on the beach for local surf schools. If you need a rental and some good advice on where to go and what to do just consult your personal concierge or head to Chuck’s Surf Shop on the north end of town. If land activities are more your speed, you can head out on any number of different adventure tours offered in Jaco. Zip line through the forest canopies, explore the jungle and mountains on an ATV, hop on a dune buggy or go out on horseback. There are endless day trip opportunities when you are based in Jaco. Take a short trip to Arenal Volcano National Park in La Fortuna or check out snorkeling in the clear waters off the Gold Coast. 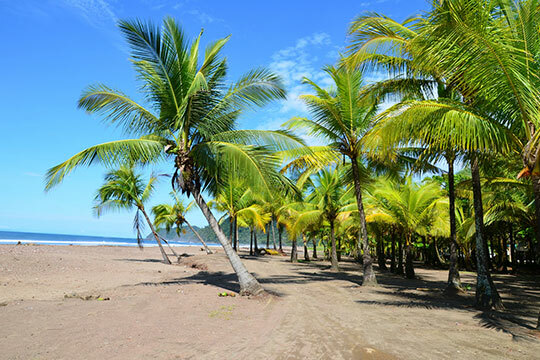 Or if you’d rather make your way down south instead of north, check out Playa Samara Costa Rica in Samara Beach Costa Rica. It is known for its white sand beaches and shallow, gentle waters – a great beach for kids and only 1 hour from Jaco. And finally, if you have the time, take a trip across Costa Rica from the West Coast to the East (a 4-hour drive) to go and explore the small Caribbean village of Chiquita Costa Rica. Jaco certainly leads the country with the most to see and do, but it’s up to you how to spend your time. If lying on the beach relaxing in the sun is more your idea of vacation, then layer on the sunscreen and crack open an Imperial (local beer) and walk 30 seconds to the sand from Villa Antigua. This is the best part about this Costa Rican gem: Jaco offers the perfect balance of adventure and relaxation. While there are several tour operators to choose from when you are selecting your activities, our concierge services have compiled a short list of our top picks for the most popular tours and excursions at discounted rates and can help you plan your stay.